A leaked transcript of DOJ official Bruce Ohr’s congressional testimony reveals new details about his interactions with dossier author Christopher Steele. Ohr told lawmakers that Steele informed him during a meeting in July 2016 about an investigation that a lawyer for Russian oligarch Oleg Deripaska was conducting into Trump campaign chairman Paul Manafort’s business dealings. 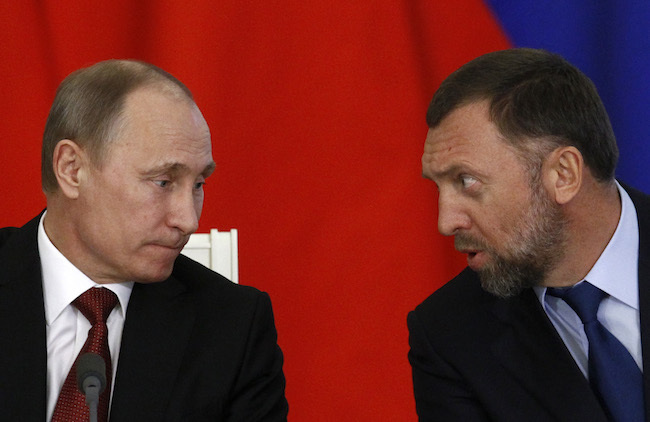 The revelation suggests a link between Steele and Deripaska, an aluminum magnate allied with Vladimir Putin. Christopher Steele told a top Justice Department official about an effort undertaken on behalf of a Russian oligarch to investigate the business dealings of Trump campaign chairman Paul Manafort, a revelation that raises new questions about the dossier author’s contacts with the Russian, Oleg Deripaska. During a meeting on July 30, 2016, Steele told Bruce Ohr, who at the time was the top career official at DOJ, that an attorney for Deripaska had gathered information about Manafort’s business dealings. “And then the third item he mentioned was that Paul Hauser, who was an attorney working for Oleg Deripaska, had information about Paul Manafort, that Paul Manafort had entered into some kind of business deal with Oleg Deripaska, had stolen a large amount of money from Oleg Deripaska, and that Paul Hauser was trying to gather information that would show that, you know, or give more detail about what Paul Manafort had done with respect to Deripaska,” Ohr told lawmakers. Portions of Ohr’s Aug. 28 congressional testimony were published Monday by The Epoch Times. Steele, a former MI6 officer, investigated Donald Trump’s possible ties to Russia as part of a project funded by the Clinton campaign and the Democratic National Committee. The result was a 35-page dossier alleging a vast conspiracy of collusion between the campaign and Kremlin to influence the election through the release of hacked emails. Manafort is mentioned in a couple of Steele’s memos, most prominently in one written on Aug. 22, 2016. The memo alleged that Manafort had received kickback payments from former Ukrainian Prime Minister Viktor Yanukovych. The memo cites a “well-placed Russian figure” who relayed information about an Aug. 15, 2016, meeting between Putin and Yanukovych where the latter discussed the payments to Manafort. Deripaska and Manafort have battled for years over a $19 million business deal to purchase cable TV assets in Ukraine. Deripaska sued Manafort in 2014 over the deal, alleging fraud. Manafort appeared eager to resolve the dispute after joining the Trump team in April 2016. He sent an email to an associate on July 7, 2016, offering to provide “private briefings” about the campaign to Deripaska. The oligarch’s camp has claimed that he never received the briefings. Deripaska is not mentioned in the dossier, and there is no evidence so far suggesting that he was a witting or unwitting source for Steele. He has previously denied having any involvement in the dossier. A link between Deripaska and Steele was first broached publicly in a Feb. 13, 2018 Senate Intelligence Committee hearing. “Do you know if Christopher Steele worked for Oleg Deripaska?” Arkansas Sen. Tom Cotton, a Republican, asked FBI Director Christopher Wray during the hearing. “That’s not something I can answer,” Wray replied, adding that “there might be more” that he could say in a classified hearing. The Hill has since reported that Steele worked for Deripaska as early as 2012. The extent of their relationship is still unclear. Ohr and his wife, Nellie Ohr, met with Steele on July 30, 2016, at a hotel in Washington, D.C. Nellie Ohr at that time was working for Fusion GPS, the opposition research firm that was hired by the Clinton campaign and DNC to investigate Trump. Days after the meeting, Ohr met with then-FBI Deputy Director Andrew McCabe to brief him on Steele’s information. Lisa Page, a lawyer working under McCabe, was also in the meeting. Hauser, the lawyer for Deripaska, did not respond to a request for comment. A spokesman for Manafort declined comment. Ohr shed light on other dossier-related matters during his congressional interview. Ohr told lawmakers that his wife investigated an alleged dossier source named Sergei Millian on behalf of Fusion GPS. Millian, a Belrus-born businessman, was reported to be “Source D” and “Source E” in the dossier shortly after it was published on Jan. 10, 2017. That source made the salacious and unverified allegation that the Kremlin has blackmail material on Trump in the form of a video tape of Trump with Russian prostitutes. According to “Russian Roulette,” a book that focuses heavily on the Steele dossier, the ABC interview was arranged after Glenn Simpson, the founder of Fusion GPS, reportedly tipped off ABC News reporter Brian Ross about Millian. Ohr mentioned Millian when asked whether Fusion GPS attempted to verify allegations in the dossier. “I think—I don’t know the specifics. The fact that my wife was looking at some of the same figures, like Sergei Millian, suggests that that was one way they were trying to vet the information,” Ohr said. Ohr said that Steele or Simpson had shared Millian’s name with him during one of their meetings. Ohr also said that either Steele or Simpson told him that someone associated with the Trump campaign knew about hacks of the Clinton campaign before they were made public. “I don’t remember if it was Glenn Simpson or Chris Steele that mentioned this—talked about—I’m going to get the names wrong, but somebody associated with the Trump campaign having advance knowledge of when information about the Clinton campaign that had been stolen and hacked, when it was going to be leaked,” Ohr said. The Epoch Times report does not say whether Ohr provided names of Trump associates alleged to have advance knowledge of hacked emails. But the question is at the center of Special Counsel Robert Mueller’s probe of Trump-Russia collusion. One former Trump campaign aide, George Papadopoulos, was told during the campaign that Russia had possession of stolen Clinton-related emails. Papadopoulos told the FBI in a Jan. 27, 2017, interview that a Maltese professor named Joseph Mifsud told him in April 2016 that Russia had “thousands” of emails that had been hacked from Clinton. Papadopoulos also had contact with Millian. The alleged dossier source unsolicitedly contacted Papadopoulos on July 22, 2016, and the pair met days later. The former Trump aide was questioned about his contacts with Millian during his FBI interview, according to documents released by the special counsel’s office. Papadopoulos pleaded guilty on Oct. 5, 2017 to lying to the FBI during that interview about the extent of his contacts with Mifsud. He served a 14-day prison sentence.